They are fantabuliciously yummy! So I had the brilliant idea of making up some bean dip to go with them, which would make a nice lunch. Oh, by the bye, I got the Ka Me Rice Crackers – Seaweed style. Seaweed is all the rage nowadays, it’s also called nori. It’s super good for the body, and these crackers are also gluten-free which was what I was looking for when I found these. I am not, to my current knowledge, intolerant of gluten, but it can’t hurt to eat less of it, now can it? 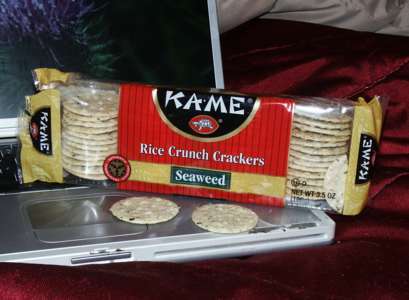 The Ka Me cracker company makes all kinds: cheese, sesame, wasabi, etc… and now that I’ve tried the seaweed and love them so much, the sky’s the limit. So after they arrived yesterday and I munched on a couple of them, I wanted a bean dip in the worst way. I had a couple of cans of white beans in the pantry, so today I got them out, looked online for a general recipe for white bean dip, and whipped it up in my food processor. It was easy peasy, and when I taste-tested it the very first time, it was perfect already. That never happens! 2 cans white (cannellini) beans drained. Just whiz all the above in a food processor for about 30 seconds. You can spruce this up to your own taste, add some spinach in with this mixture, add roasted red peppers (oh yeah!) or parsley or other herbs. Go wild. …but I have to tell you, those Ka Me crackers above went with this bean dip so well… I am so excited. 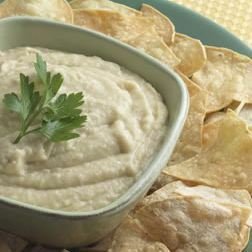 The dip (or spread or hummus, whatever you want to call it) could also be made with chickpeas or kidney beans, black beans, whatever kind of beans you have on hand. Some people use raw beans and cook them, but that is way too labor-intensive for me. Canned is fine. Just rinse the beans off after you take them out of the cans. Keep the dip in the fridge. It’s a quick way to get your protein, and the seaweed in the crackers is just a huge bonus. Bex, you might find (or Paul might) those crackers in your own grocery store in either the cracker or international food aisles. Those have been a normal grocery store brand just about everywhere I’ve lived, both US and Canada. Thanks, Bex! Sounds so good. Need to get my vita-Mix out and give her a whirl! So do I, Beanie – love rice crackers and I’d never had them before yesterday. Yes Mike, the possibilities are endless. Beans are so good for you and if you’re a vegan, even better. Of course, the kale will probably turn a white bean dip green, so maybe a kidney bean dip might work better with the kale… Or you could just add tiny bits of kale AFTER you’ve whizzed the beans etc. together…just “stir” in the kale so it doesn’t turn it all green. OR… you could tear off a large leaf of kale and fill it with the white bean dip and roll it up like a “wrap”… even better! I eat kale (and really, all kinds of dark greens) a lot because there is so much vegetable protein in them, and I don’t get any protein from animals. I can see a lot of possibilities for this dip! Absolutely Michael… substitute away! That’s the great thing about a recipe like this… use what you have… now remember my old tip… once you make up the mixture, and BEFORE adding the mustard… stick your face down and sniff the mixture and then sniff the mustard and you’ll able to tell right away if they “go together” – but I would think they would. If you like onion or have some onion powder, that could be added here. Or even better, CHIVES! Or EVEN BETTER – CHOPPED KALE!! I would have added kale but Paul couldn’t find any last week at the food store… this week he better come home with kale because it’s my new favorite food. The dip looks so good! It’s another one I’ll definitely try, and I already have most of the ingredients. Wonder if I could substitute whole grain mustard for the horseradish. (Why not?) Thanks, Bex. I love this recipe. I could eat it for days. Which reminds me I have some hummus in the fridge. I think I will go and have a bite. Thanks for sharing. sorry San..I should have told you before you went today! The dip would be greet with raw veggies – the crackers are a little salty but not like a chip or a tortilla chip… but just so you know…. maybe they have some unsalted kind? I don’t know.